As the 2018-2019 hunting season draws to a close we felt it was a good time to reflect on one of the main events in the annual hunt calendar – the annual boxing day hunt meets that take place throughout the UK. Boxing Day meets are considered to be the most significant in the hunting season and viewed by hunt supporters as important traditional events. But increasingly, this view is being challenged by anti-hunt protesters, disgruntled local people and others who have become aware that hunts up and down the country flout traffic laws and basic public safety, essential at these equine events. 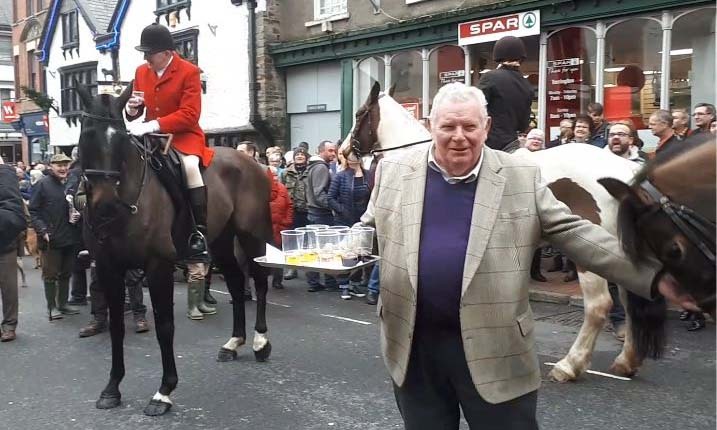 Towns and villages throughout the UK have traditionally been used by hunts to stage their boxing day events, often outside a friendly public house which provides alcoholic libations to riders and hunt supporters. In 2018 violence erupted in many locations, between peaceful hunt protestors and ardent hunt supporters who were not happy that their traditional events were receiving unwanted, negative attention and criticism. Here’s just a handful of reports from the national press. Onlookers including children almost trampled in Newport, Wales. More on this last report of the Torrington Farmers Hunt (who are a branch of the Pony Club) in Great Torrington on Boxing day later in this post. Boxing day hunt meets attract widespread condemnation because fox hunts are continuing to hunt foxes, contrary to the Hunting Act 2004. Although the Countryside Alliance and various hunts tell people that these days they are engaged in what is called ‘trail hunting’, they are not. This is an outright lie that is widely known as such within hunting circles. Hunts repeat this lie to the public, the police and the media while they continue to actively hunt foxes with impunity. Every week groups of hunt monitors, wildlife monitors and hunt saboteurs put themselves at risk in order to both gather evidence of illegal hunting activity and prevent hounds from killing foxes and other wildlife. These brave people are doing work that should be carried out by our police forces and wildlife protection authorities. 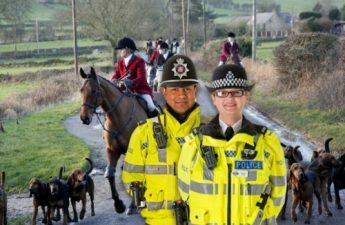 Every week throughout the hunt season there are numerous reports and video recordings of serious crimes committed by hunts and hunt supporters, most of which are not investigated by the police. These crimes regularly include serious assaults on monitors and hunt saboteurs, theft of recording equipment, blocking of public rights-of-way to prevent access to the hunt, tampering with badger setts which are often blocked, vehicle damage, lots of road traffic offences including animals out of control on busy main roads along with brazen, blatant breaches of the hunting act. So it’s not surprising that people feel the need to protest at these hunt meets to draw attention to the fact that hunting is continuing to take place and that many serious crimes, committed by hunts and hunt supporters, are not being investigated by the police. Here’s a report from Devon which brutally highlights why anti-hunt protesters, hunt saboteurs, hunt monitors and wildlife champions protest at hunt meets. Fox savagely killed by hounds on Boxing Day. Multiple polls have shown that over 85% of people in the UK are opposed to repealing the fox hunting ban. Here are some other relevant polls. Do you support the practice of hunting foxes with dogs? 87% say ‘No’. Do you agree with fox hunting? 92% say: ‘No its barbaric’. With these statistics it’s hard to believe that fox hunting is still active in the UK at all, but it is! Those who support and engage in this barbaric, sadistic hobby are notoriously arrogant, belligerent and violent. 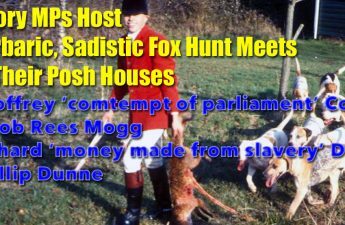 After all, their favoured passtime involves terrorising wildlife, riding roughshod over other people’s land, frightening livestock, causing mayhem on the roads and ultimately enjoying the spectacle of a fox being torn apart by their hounds. They use bullying, threats and intimidation to scare protesters and members of the public who disapprove of their perverse hobby. They are well connected and well funded by members of the establishment who use their political influence and conspire with their networks of like-minded supporters to avoid facing the force of the law. But times are changing and people are rising up! 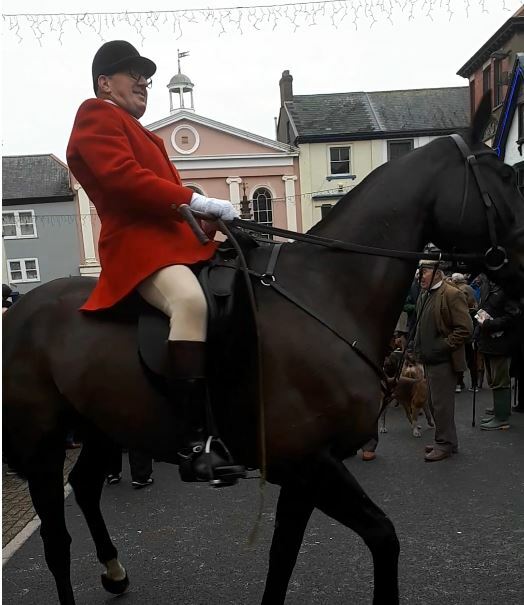 Public pressure in St Ives, Cornwall has resulted in the local hunt being barred from attending the centuries old Feast Day celebrations in the town for the first time in 200 years. 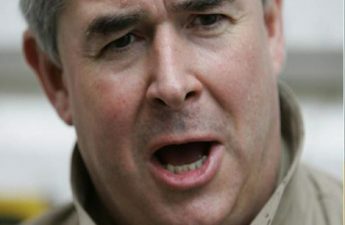 Hunt barred from St Ives Feast Day. Hunt snubbed by organisers of annual St Ives event. Similarly in St Just, Cornwall, the attendance of the Western Hunt at the annual Feast Day has met with disapproval and a move toward banning them from attending. St Just Moves to Ban Hunt. And in Elham Village, Kent, the local hunt has been forced to hold their Boxing Day meet at their kennels, away from the centre of the village where they anticipated encountering significant opposition. To illustrate the arrogance of hunts and their clear disregard for anyone but themselves we are focusing on the Torrington Farmers Hunt, who are a branch of the Pony Club. They traditionally hold their boxing day hunt meet in the centre of Great Torrington in Devon, outside the Black Horse public house, in the town square. The roads in the centre of Torrington are very narrow with buildings on all sides and limited room for event spectators, horses and hounds. The limited open space in Great Torrington town centre presents some significant safety issues when holding an open equine event in this location. Mark ‘the misogynist’ – likes to taunt women with sleazy, sexist remarks. Prior to Christmas 2018 many members of the public, concerned for safety at this event, (which is open to the public and attended by children) attempted to confirm that the required risk assessments had been carried out, safety precautions would be in place and that the organisers had acquired the necessary public liability insurance for such an event. Torrington Town Council were contacted and they referred enquiries to Torridge District Council. Torridge District Council were contacted and they told enquirers that, since the event is held on the road and pavements, it falls under the jurisdiction of Devon Highways. So they were contacted by email and told the enquirers that they had not been informed of the forthcoming Torrington Farmers Hunt meet and therefore had no knowledge of the imminent event. It is interesting to note that although this well known event has taken place in this location for many years all of the local authority departments contacted reported that they had no knowledge of it. During the hunt meet the huntsman, recorded in the videos shared in the press (Mark the misogynist), was directly asked the questions: Had they carried out the required risk assessment and had they obtained the necessary public liability insurance. His response was to ignore the questions. 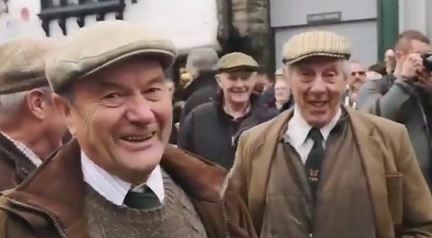 Instead he chose to level some peculiar, sexist, misogynist remarks at a female videographer and the peaceful protesters, eliciting chuckles from his Torrington Farmer friends, who appeared to find it funny to witness their huntsman and therefore a representative of their branch of the Pony club abusing women. Not a great advertisement for the Pony Club. Torrington Farmers – Amused by sleazy, sexist misogyny. After the event an investigator contacted the Highways Manager responsible for Enforcement and Events at Devon County Council. The Highways Manager explained the procedure that event organisers should adhere to in order to safely hold events on public highways and pavements where road traffic might be blocked in Devon. This recommended procedure is similar in all areas of the UK. While it is not compulsory for event organisers to alert their local Safety Advisory Group to their planned event it is strongly encouraged. And if the planned event is likely to have an impact on road traffic, then an application for a Temporary Traffic Regulation Order must be made. This is not optional, it is mandatory. For such a request to be granted the organiser must provide full details of their public liability insurance which would require a risk assessment to have been carried out. Here’s an excerpt from the Devon County Council website. The application to the Safety Advisory Group is required to have been made 3 months prior to the event. By following this procedure the relevant Safety Advisory Group is able to confirm that a risk assessment has been carried out, public liability insurance is in place and any special safety requirements for the event are identified and implemented in time to keep people safe. The Highways Manager at Devon County Council (an ex-police officer) pointed out that if an event takes place on a public highway which causes an obstruction and the organiser does not have permission to close the road then a ‘wilful or unnecessary obstruction of the highway to vehicles or pedestrians’ may possibly occur. These offences fall under Regulation 103 Road Vehicles (Construction and Use) Regulations 1986 or Section 137 Highways act 1980. Enforcement of these regulations is the responsibility of the police force. The Highways Manager confirmed that, since the centre of Torrington was completely inaccessible to traffic for over 2 hours on the 26th of December 2018, a Temporary Traffic Regulation Order should have been obtained and appropriately qualified personnel should have been put in place to safely direct traffic. The Torrington Farmers Hunt meet was clearly guilty of a ‘wilful or unnecessary obstruction of the highway to vehicles or pedestrians’. And this serious breach of road traffic regulations, which could prevent emergency vehicles from saving lives, has taken place in the centre of Great Torrington on Boxing Day year-after-year. Torrington Farmers Hunt branch of the Pony Club – Illegal Street Collection – Begging? A traditional feature at these Boxing Day Hunt meets, up and down the country, is that they carry out a street collection for cash, apparently intended for their hunt supporters. In order to carry out a street collection for cash anywhere in the UK a licence must be obtained from the local authority. This is another mandatory requirement that has been ignored year-upon-year by the Torrington Farmers Hunt. Torridge and District Council require that a street collection licence is obtained in order for charity collections to take place. If you want to collect money or sell articles in any street or public place within North Devon, for the benefit of charitable or other purposes, then you must hold a street collection permit. The main difference here is that North Devon refers to ‘or other purposes’ whereas the Torridge and District Council advice refers exclusively to charitable collections. The key point is that all hunts which carry out street collections at their events must be in possession of a street collection licence. This is mandatory. What’s more, the person or people who are collecting the cash must be fully aware of the code of fundraising practice and its associated rule book published by the Institute of Fundraising (IoF) and they must all be recognised as ‘fit and proper’ persons. To obtain a street collection licence they must have submitted their application to the local authority at least one month before the event. 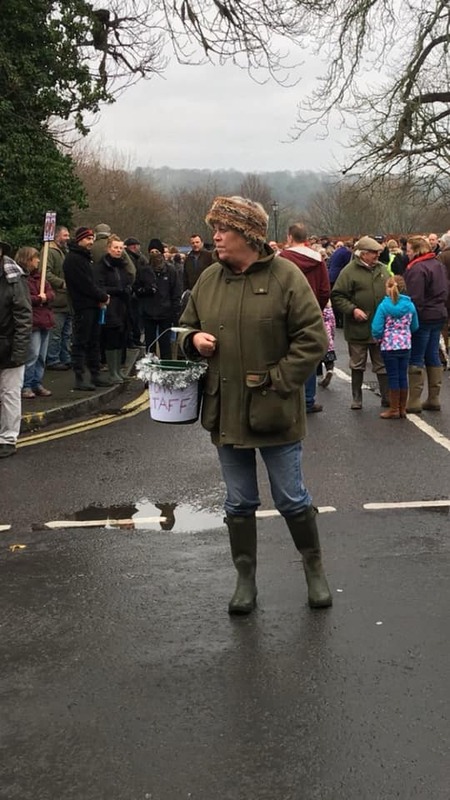 At the Torrington Farmers Hunt Boxing Day meet in 2018 the man carrying out the street collection for cash was directly asked if he could present his street collection licence. His response was a long, hard stare, probably intended to be threatening. He clearly did not have the required licence so the street collection, much like the road blockage, was completely illegal. Carrying out street collections without a licence makes the person responsible liable for prosecution under the vagrancy act, widely used by local authorities to punish homeless people who collect cash on the streets. Begging is an offence under section 3 of the Vagrancy Act 1824. It is a recordable offence. The maximum sentence is a fine of £1000. So, by failing to obtain the required street collection licence the Torrington Farmers Hunt was arrogantly guilty of yet another crime. In order to confirm that an application for a street collection licence had not been made by the Torrington Farmers Hunt (a branch of the Pony Club) a ‘freedom of information’ request was made to Torridge and District Council. The response confirmed that at no time over the past 6 years had the local authority received such an application. Similarly, a request was submitted to Devon County Council regarding applications for Temporary Traffic Regulation Orders over preceding years to allow the Torrington Farmers Hunt to legally block Great Torrington town centre. It was confirmed that no requests for temporary road closures in the centre of Torrington on Boxing Days in previous years had ever been received and that at no point had the relevant Safety Advisory Group been told of this event. These verifiable investigations confirm that the Torrington Farmers Hunt branch of the Pony Club along with the Black Horse public house, as organisers of the 2018 Boxing Day hunt meet in the centre of Great Torrington, were guilty of both ‘wilful or unnecessary obstruction of the highway to vehicles or pedestrians’ and ‘begging’. Full details have been shared with the police. Since the Stevenstone & Torrington Farmers Hunt are a branch of the Pony Club it would not be unreasonable to expect all events organised by the TFH to totally adhere to the highest possible safety standards – since the Pony club is all about engaging young people in horseriding and equine skills. Here’s an excerpt from ‘The Rules of the Pony Club’ regarding health and safety. activities of The Pony Club. 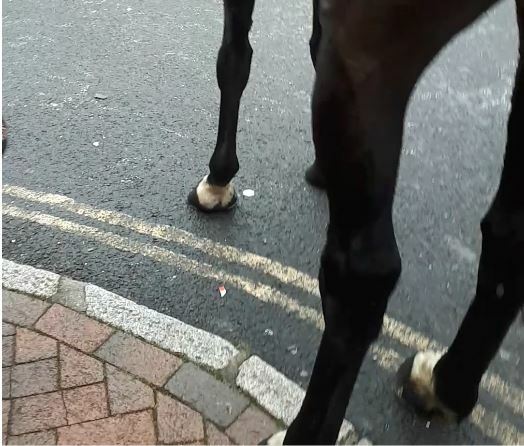 The clear need for barriers between the riders and spectators was demonstrated by the Torrington Farmers huntsman when he backed his horse into people who were stood on the pavement outside Torrington town hall, as can be seen in this image excerpt from a video recording of the incident. Torrington Farmers Huntsman’s horse on the pavement – Demonstrating a clear need for barriers. It is perhaps worth noting that investigations into safety arrangements at events in Great Torrington revealed that other events, such as the Mayfair and Carnival, fully comply with safety recommendations. The Torrington Town Council along with other local event organisers take great care in ensuring that health and safety assessments are carried out, additional safety precautions (such as barriers) are put in place where necessary and that the required public liability insurance is obtained and verified. So why does the Torrington Farmers Hunt bypass these basic but essential safety requirements? It is also worth remembering how important tourism is to the economy of North Devon. People like to bring their families to the region and enjoy the wide range of attractions and events that are on offer. When they attend these events and locations they expect them to be as safe as they possibly can be, especially if they are taking children along. If prospective visitors to the area learn that, while they might expect events to have been verified as safe for them and their children to attend, in fact some have not carried out a health and safety evaluation, they have not adhered to local Safety Advisory Group recommendations and they have not obtained the required public liability insurance, these parents are likely to think twice about bringing their children to the area. Another important consideration, raised by a local agricultural worker, is that if the Torrington Farmers are showing such disregard for safety at this public event what are they doing, or not doing, on their farms where they are not so open to public scrutiny? The suitability of Great Torrington Town centre for an equine event should be assessed. Barriers are required along pedestrian walkways. Signage is required to indicate designated pedestrian pathways. The event must comply with the British Equine Foundation Safeguarding and Child Protection policy. The consumption of alcohol by riders should be included in the risk assessment. Here’s a summary of the failings of the Torrington Farmers Hunt at their Boxing day hunt meets regularly held in the centre of Great Torrington. At no time have they attempted to obtain required Temporary Traffic Regulation Orders, necessary when blocking the roads. They have never carried out a risk assessment of Great Torrington with regard to holding an equine event attended by children at this venue. They have not obtained the required public liability insurance for this event. 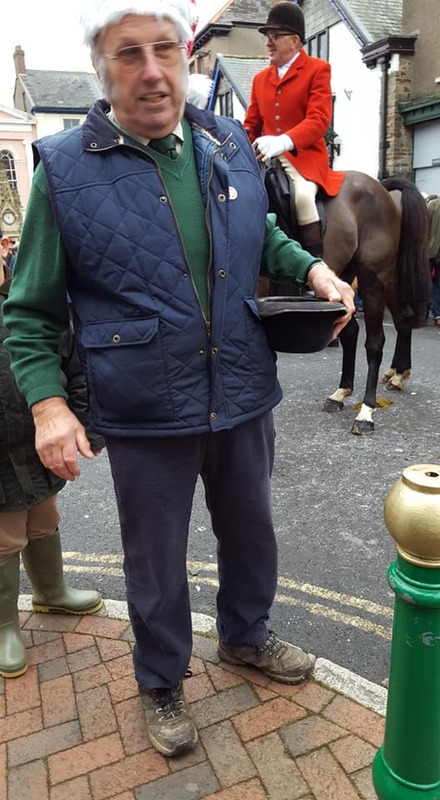 At the most recent event the need for safety barriers between spectators and riders was clearly demonstrated when the huntsman backed his horse into onlookers who were stood on the pavement. Each year they carry out an illegal street collection for cash. These failings not only apply to the Torrington Farmers Hunt (who are a branch of the Pony Club) they are also relevant to many other hunts throughout the UK. It is interesting to note that some Devon hunts have already started to change their ways and did submit applications for Temporary Traffic Regulation Orders along with evidence of their public liability insurance in order to hold their 2018 events. In future it is expected that all Boxing day hunt meets should be fully compliant with safety recommendations provided by Safety Advisory Groups and local authorities. They should all have carried out thorough risk assessment, taken appropriate precautions to ensure public safety and hold the required public liability insurance. Also, in order to carry out street collections for cash they must have obtained the required street collection licences from their local authorities. Failing to comply with these basic requirements shows an arrogant disregard for both public safety and the rule of law.